This DVD Ripper software is designed with many pre-defined output profiles. It highly supports most portable iOS and Android devices, such as iPhone X/8/7 Plus/7/6s Plus/6s/6 Plus/6/5s/5c/SE, iPad Pro/Air 2/mini 4, iPod touch, Samsung Galaxy 7/6/5, LG G5, Sony, HTC, Moto, Xiaomi, HUAWEI, Microsoft Surface Book, Xbox 360, PS3, Wii and others. It allows you to easily view DVD movies on your smart phone or tablet. 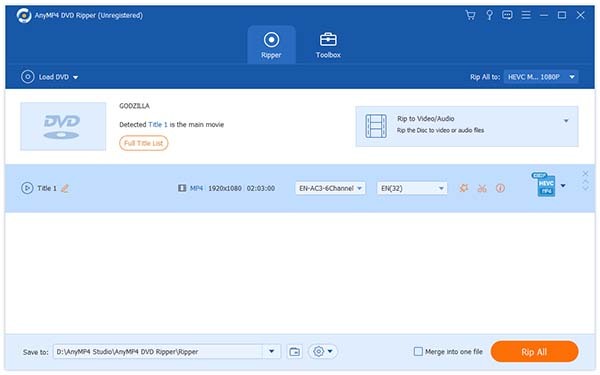 Whether the DVD is copy-protected or self-burned, you can use this DVD Ripper to rip the movie for your digital devices. Statement: First, please download the orginal installation package by clicking the download link. Of course you may also download it from the publisher's website. Using AnyMP4 DVD Ripper crack, key, patch, serial number, registration code, keygen is illegal. The download file hosted at publisher website. We do not provide any download link points to Rapidshare, Hotfile, Depositfiles, Mediafire, Filefactory, etc. or obtained from file sharing programs such as Limewire, Kazaa, Imesh, Ares, BearShare, BitTorrent, WinMX etc. Software piracy is theft. If you like AnyMP4 DVD Ripper please buy it.